(Clockwise) The pre-release promotional poster at Landmark bookstores. The US hardcover version. J.K. Rowling surrounded by fans at a launch party for Harry Potter and the Deathly Hallows. In Harry Potter and the Deathly Hallows, the last of the Harry Potter books that released the world over in July 2007, Albus Dumbledore, the late headmaster of Hogwarts School of Witchcraft and Wizardry, bequeaths a book to his student, the nerdy Hermoine Granger, in his will. In the ancient-looking book, “stained and peeling in places", with a title embossed in runic symbols, Hermoine finds a strange symbol which is later revealed by Xenophilius Lovegood, father of one of the students and editor of The Quibbler, to be the symbol of the Hallows. This book within a book, is supposedly a collection of fairy tales known only to children born into wizard families, but now’s your chance to read it. The book has generated a far amount of pre-release buzz. In the US and UK, publishers are quite nervous about Christmas sales this year because of the economic slump. But they’re counting on the Harry Potter offshoot, releasing just before the Thanksgiving rush, to be a saviour. Publisher Scholastic has ordered a first printing of 3.5 million copies (for The Deathly Hallows, the number was 12 million). In India, Penguin Books India, which is distributing the book, is optimistic about its sale in the first week. The book will be available in all the leading bookstores in the country and should reach 800-900 stores. “We do have an extensive print marketing programme and you will see a lot of posters and other material that we will send out around the country to bookshops, and readers," says Ananth Padmanabhan, vice-president, sales, Penguin Books India. The book, though small is expensive because, says Padmanabhan, there’s a certain committed contribution to charity in the UK. “But we are sure Rowling fans will queue to buy copies," he says. 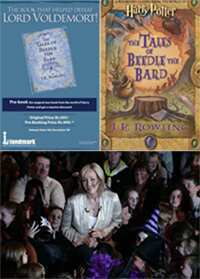 The India edition: The Tales of Beedle the Bard: Penguin India, 128 pages, Rs599. Odyssey is getting the largest number of copies with 10,000 copies. “We are confident of selling about 5000 to 6000 copies by the first week, as has been the case with the Harry Potters in the past," says Harsh R. Grandhe, vice-president, marketing, Odyssey Bookstores. They are also offering a pre-release booking price of Rs501. Landmark bookstore has ordered 5,000 copies and they have had around 500 pre-release bookings till Friday. “While this is not as big as the Harry Potter books, there has been a tremendous buzz picking up especially since we put up our in-store posters for the book last week," says Madhu M., category head, books, Landmark. The last day for pre-release bookings in all bookstores is 3 December.